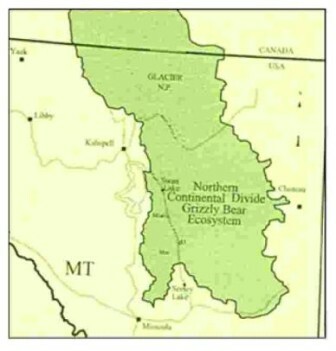 Grizzly Bears in Northern Rockies: A Lasting Success? This year the Endangered Species Act is celebrating its 40th birthday. That’s four decades of saving fish, plants and wildlife from disappearing forever. Since the law was overwhelmingly passed by Congress in 1973, only a tiny handful of species have gone extinct. The decline of hundreds of other species has been halted, and some have already been successfully recovered to sustainable levels. And thanks to the Act’s habitat protections, millions of acres of public land have been protected for these and other species. Any way you slice it, the Endangered Species Act has been an extraordinary success. One of the more promising success stories has been the iconic grizzly bear—a key part of our unique Western American wildlife heritage. Once wide-ranging and numbering in the tens of thousands, through overhunting and habitat loss, grizzlies were reduced to merely a couple of hundred bears in isolated pockets within the lower 48 states by the time they were listed under the Endangered Species Act in 1975. As the slowest reproducing mammal on the planet—a female gives birth to just two or three cubs about every three to four years, at most—grizzly bears were initially lethargic in responding to conservation efforts. Lethal conflict with humans, as well as ongoing habitat loss and fragmentation continues to be problematic for bears. Today, grizzly bear numbers are still a fraction of their historical population, but in at least one of the six designated “recovery areas”—the Northern Continental Divide Ecosystem (NCDE) in Montana—the bears appear to be doing well, and even expanding their range. This has taken a lot of effort, not only by state and federal wildlife managers, but also by conservation advocates who have had to push agencies at times to institute the scientifically-required protections for grizzly bears and their habitat. Within the next two years, the U.S. Fish and Wildlife Service will likely propose the removal of the NCDE grizzly bear population from the list of threatened species. In the meantime, the Service and relevant state and federal land and wildlife managers are developing a plan that will guide post-delisting conservation and management of the bears, once Endangered Species Act protections are removed. The Endangered Species Coalition has been studying this complicated draft plan closely, and we are working with our conservation partners in the region to make it stronger. Because habitat protections are so critical for bears, this area of draft plan in particular needs to be strengthened in order to ensure that grizzly bears in the NCDE continue to thrive even after they are delisted. Any member of the public is welcome to comment on the Draft Conservation Strategy for the NCDE, and you may submit comments on the plan via email by August 1 to: NCDECS@fws.gov.